I’m not sure precisely who is in the “next generation of Republican leaders” — it seems like there are about 20 names of current and former Governors and Senators being thrown around as likely candidates — but I think Romney made the right decision. You can only run for President so many times before you become a bit of a joke, like Harold Stassen or Hubert Humphrey were when I was a kid. Two runs is about the maximum, and if you’re going to bump up against that rule of thumb you may as well exit stage right with some class. Romney did that with his statement on Friday; good luck to him and his family. R omney was leading in preference polls, so his exit gives the Republican race a wide-open feel. What about the Democrat frontrunner? Hillary Clinton has been laying low recently, with few appearances on her calendar. Some say she wants to let Republicans fight and then emerge in the spring as a fresh face; others wonder if she isn’t brushing up on her political skills after a rocky book-signing tour. If Hillary Clinton is in fact going to run, maybe she it would be a good idea for her to give some careful thought to messaging. Yesterday I saw the bumper sticker pictured above at a stop light at a Columbus intersection, and it was a clinker for me. Why should voters announce that they are “ready” for Hillary? 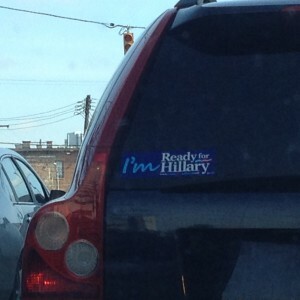 Is the bumper sticker suggesting that America has previously been a benighted land that is only now ready to finally recognize the merits of Hillary Clinton? Shouldn’t the burden be the other way around — that it’s Hillary Clinton’s burden to show that she is ready for the most difficult job in the world? The bumper sticker seems to tie into the theme that some potential Democratic candidates are beginning to float that Clinton is an arrogant, out-of-touch frontrunner whose campaign is based entirely on overwhelming fundraising and an ominous sense of inevitability. It’s not an especially attractive theme for a presidential campaign.